How I thank the Lord for His Word! The above verses have been such an anchor for me the last number of weeks. We have been going through a very difficult trial as a family, but as I have meditated on who God is, especially that He is FAITHFUL, the Lord has given strength and even joy in midst of the trials. It’s especially encouraging to me to know that God’s faithfulness doesn’t depend on OUR faithfulness! “HE ABIDETH FAITHFUL”—all the time! What a great God we serve! Right now, Jim is in the middle of the Amazon jungle, in the city of Iquitos, Peru! That’s why I (Melody) am writing the prayer letter. Jim left with a team of five young people on Sunday afternoon. They crossed the border into Tacna, Peru, where they took a bus that was supposed to arrive in Lima 18 hours later. Well, because of a mudslide in one place and a river crossing the road in another, the trip took 30 hours! I guess you can’t have a mission trip without adventure! But the Lord was with them and they made it to Lima from where they flew to Iquitos. You can only get to Iquitos by air or by boat. Two other young men met up with them there. They will be doing several VBS’s and also have special meetings. 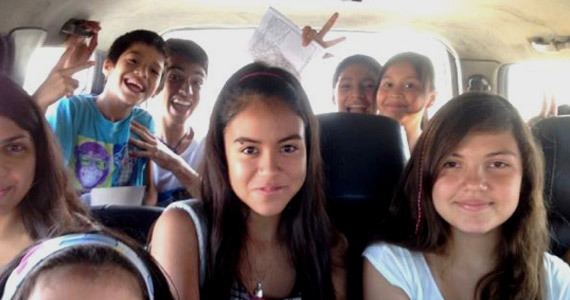 This is our first mission team to come out of our church. They are set to start back home on the 25th. 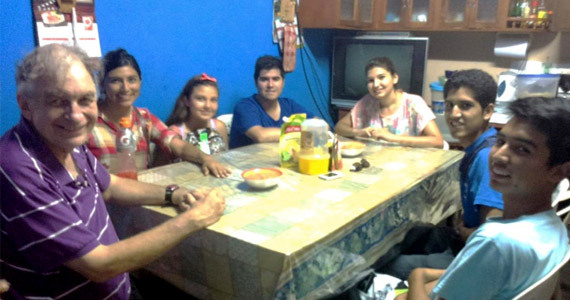 I am including a picture of the team at Pastor Juan Hoyos’ house in Iquitos soon after they arrived. We pray this trip will be used in their lives in a mighty way and that the Lord will use each of them in the lives of others there in Iquitos. The Lord gave me the blessing of being able to go to Recife, Brazil the last week in January for a congress of the Latin American Alliance of Christian Churches (ALADIC). We really didn’t feel we could travel as a family, but since I was in charge of the Ladies’ meetings at the Congress we decided that I would go. I really enjoyed the Congress, the beautiful scenery and the sweet Brazilian people. It was a joy to me to be able to teach the ladies at the Congress during our meetings. It was fun trying new things, like coconut water and pulp, different fruits and sugar cane juice from street vendors. When I first got there I had a really hard time understanding the Portuguese. While it is similar to Spanish, there are many differences. I had forgotten how frustrating it can be to learn a new language! By the end of the week I had learned a few words and could understand a little more. At least I could sing in Portuguese! That was fun! On Sunday morning we had the closing exercises of our Vacation Bible School. Thirty-eight children attended in total, the high being 34 on Friday, and the biggest blessing was that at least half were NEW children who don’t attend church! Our van was full most every day (with 16 in the car being the record)! We had a good number of visiting parents on Sunday morning too. Another blessing of the VBS was that we had plenty of workers and helpers! It is wonderful to see our people’s enthusiasm for VBS. The treasurer of our church said that he thought investing in VBS was the most important thing we could do with the church’s funds. We thank the Lord for His goodness. We’d also like to share some prayer requests with you all. There are many uncertainties facing us in the upcoming months and we need much wisdom from the Lord. Since our daughter Becky is graduating from Bob Jones University in May, we think maybe that would be a good time to take a short furlough. Our last furlough was when we took her to start college. How time passes! Most likely we would only take four or five months since there is no one to take our place here. Therefore we would not be able to visit ALL of our supporters, but we’d certainly try to visit as many as possible. With furlough also comes all the uncertainties of finding a vehicle, a place (or places) to stay/live, where to travel, etc. A couple of other things also make it a little complicated. The contract for renting our house is up in May, so it’s very possible we’ll have to find another place to live here. Becky and Jeremy’s plans for the summer are also undecided as well. Although Becky is planning on going on the SOME team to Kenya, she doesn’t yet know what the Lord wants for next year. So we may have to find a place to store her belongings during the summer. Jeremy is required to spend 200 hours working in a restaurant (for his Culinary Arts major) but doesn’t yet know where and how he can work out housing, transportation, etc. I have to admit, just writing about it all makes me a little anxious. So I must remind myself, once again, that GOD IS FAITHFUL! What peace there is in knowing that! Furlough plans—dates, housing, vehicle, etc. We know that our Faithful God is able to do “abundantly, above” all that we ask or think, and that somehow in His providence He uses the faithful prayers of His children. And so we say “THANK YOU” for faithfully praying for us and for the Lord’s work here in Arica, Chile. Some years ago we were together in Porta Negra. I hope and pray you all are doing fine, our Lord is good. As far as I know the ICCC is doing nothing after 2012. Is the President still living ? Sometimes I get the messages from Keith Coleman, but for the moment I’m not up to date. May be you’ll have some information about the ICCC ? Praying for all the missionaries. Our Lord be with you !